A spring half marathon as a Christmas gift? My top 5… – Pewts. One of the key pointers in December’s Marathon Blog was to book yourself at least one other race in the months building up to the big day. 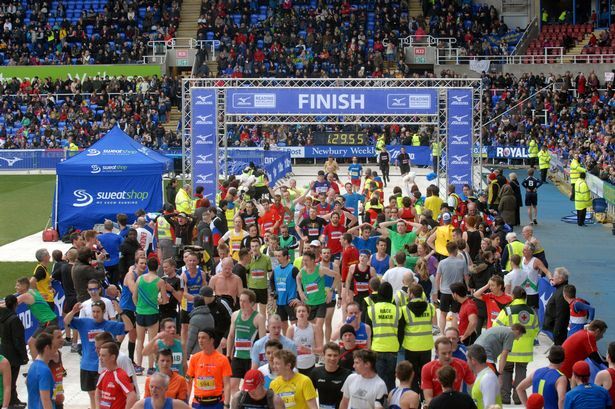 February & March throw up some excellent road races around the UK. A half marathon is a great marker to test your fitness, It can give you a secondary, more manageable goal to aim and is good preparation in terms of tapering the week before. It is also a useful tool for understanding how you manage your time & body on race day as well as learning how to recover afterwards. You might decide to run this slightly quicker speed perhaps than your marathon pace, but either way it should give you a huge mental boost ahead of your goal of 26.2. Notes: A personal favourite of mine. It’s a flat route that takes you around some of the best sites in Brighton including both piers, the pavilion & the famous hove beach huts. Crowds are always good and you can’t go wrong with a celebratory fish & chips afterwards. As the majority of the course is on the seafront, you are praying for no winds. But it’s a well organised event by Sussex Beacon, a local charity. A good chance to get a PB, but less so than previous years (they have even rectified the catastrophic mistake that left the course 124m too short!) Well worth signing up for! Notes: If you’re looking to celebrate completing your half marathon by showing off your medal wearing a crown and sitting upon a golden throne, then this is the race for you! Starting in Thames Ditton it runs along both sides of the tow path of the river Thames, passing the grounds of Hampton Court Palace. Well organised, scenic and with good crowds as you run through Kingston. It can get a little congested at the start if you’re knocking around the 2 hour pace as there is a small element on footpaths, but probably no worse than running a popular event (good practice for overtaking others!) Also there are some superb pubs in the area for a post-run pint & Roast Dinner. Notes: This is another race I’m looking forward to doing. It’s quick, gaining a reputation for one of the fastest half marathons in the south. This is proven by the calibre of athletes turning up at the sharp end. (Paul Martelleti bringing it home in under 70minutes last year) But regardless of your speed, the coastal route is popular with crowds as the course is condensed and set in amongst the centre of the town, so plenty of places for your friends to support and cheer you on. There is also the option to do a 10km on the same day, so bring a friend along with you. Notes: A slight left field suggestion, but it looks fun & one I’m eyeing up for slightly longer race practice as it’s later in the year, maybe a 20 miler! Set on the Leeds to Liverpool canal. This running festival has a 5km, 10km, 10 miles, half marathon, 20miles, marathon & even an ultra marathon. It looks like a light-hearted out and back course, pretty flat (you would hope on a canal, with the only undulations being the locks.) Foulridge tunnel which is part of the Leeds and Liverpool canal has some interesting folklore surrounding it. The story goes that a cow fell into the water at one end of the tunnel, the cow then swam the whole length of the tunnel, (1 mile) before being pulled out at the other end and thankfully being revived with Brandy. Unfortunately, they have said no brandy will be handed out at drinks stations. There are tons of great half marathons to consider though, I haven’t even mentioned Big Half, Eastbourne Half, Bath Half, or Leicestershire Half. if you want to find a good way of searching out events, check out (https://findarace.com/half-marathons) If you have any good additions, extra notes or a particular favourite, let me know – either by email (joshpewter@gmail.com) or on social (@pewtsrun) Ciao! Pingback: The start of your marathon journey – Pewts.